In the first half of the 900 was born an artistic movement called Surrealism; the aim of surrealists was to paint absurd situations and concepts… in a realistic way. This ingenious combination created an alienating sensation in the observer. 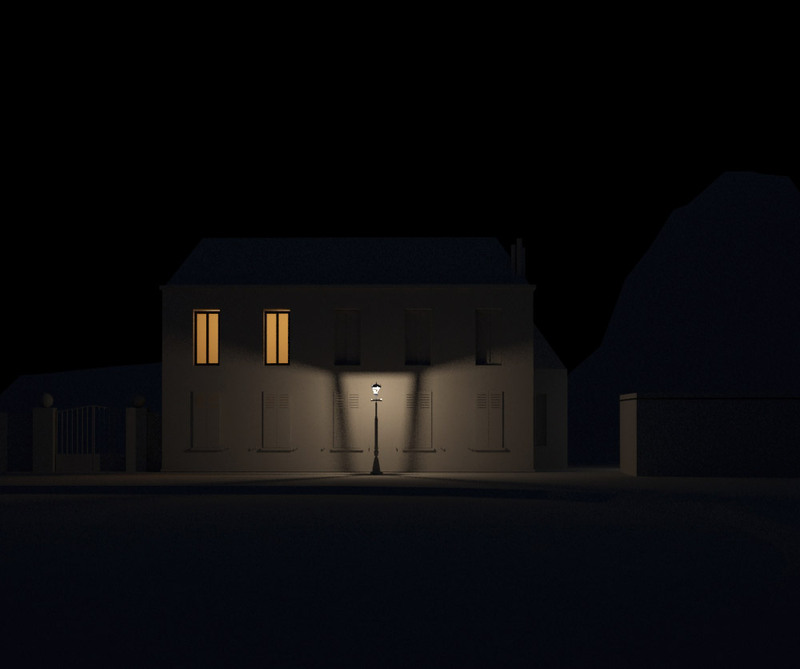 So I asked to myself: can I do something similar with rendering? 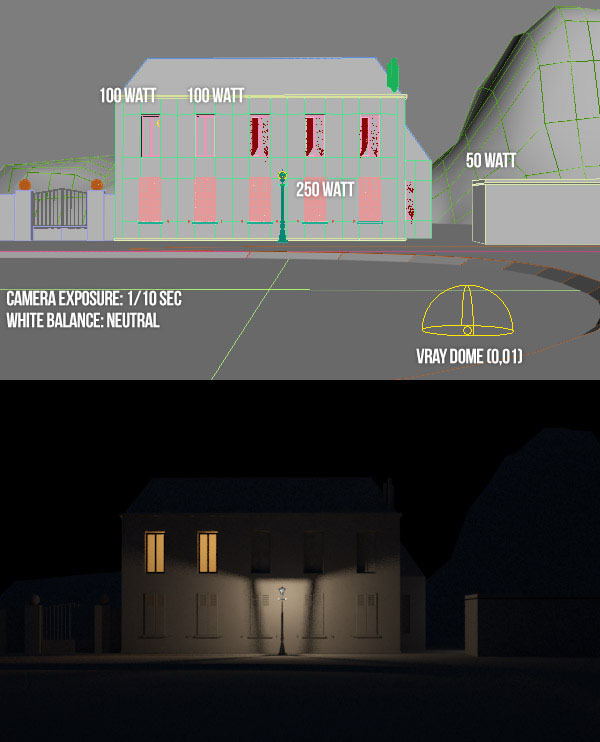 Can I do the… Photosurrealism with V-Ray? Even if Magritte lived in the age of the first cameras, I do not think he could see certain kinds of shots at dusk. But in this magnificent picture he goes very close to the photographic reality! In fact, at dusk when a camera photo sees “dark” the sky is still very bright. 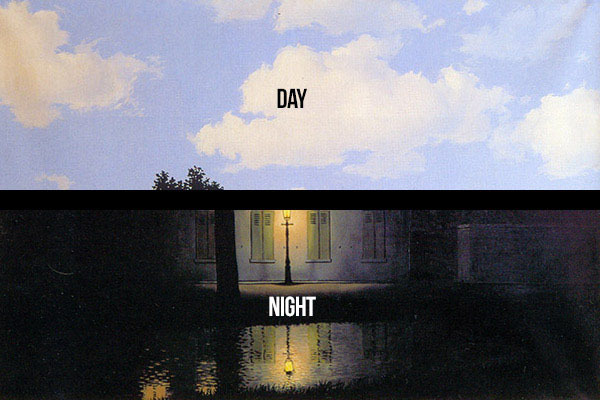 Magritte fully realizes this, bringing the artistic gesture to the hilt: the night is dark night, and the sky is bright as full day. If I had told you, you would not believed it, then you’ll look at it and you realize that it works! Day and night coexist in a single canvas, in an unexpected and perfect combination, magnetic and alienating. I placed the camera as similar as to the original, using the same exposure as you would use at dusk (1/10 of a second), and I placed artificial lights with similar power, positioning them where they are in the picture. As usual without using tricks or strange things. 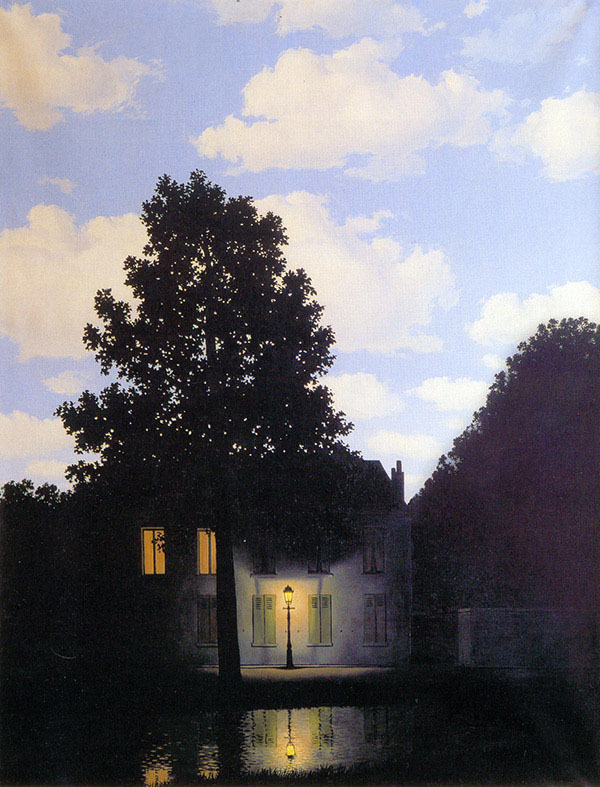 Much of Magritte’s work is characterized by vegetation in silouhette. Lately I’ve been using Forest Pro (which I highly recommend), so in a few minutes I placed all the trees and grass where necessary, in order to achieve the desired effect. Note: I could add the background in post production, conceptually it is the same. 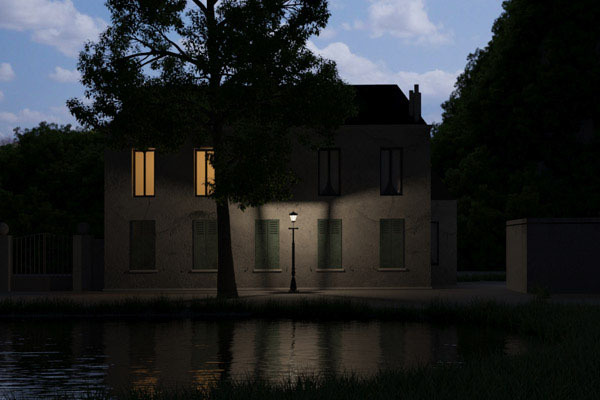 But many trees in backlight could give me masking problems due to the antialiasing. So I decided to incorporate the background directly in the render. The “lower part” also includes the lake, in the context does not reflect the sky. 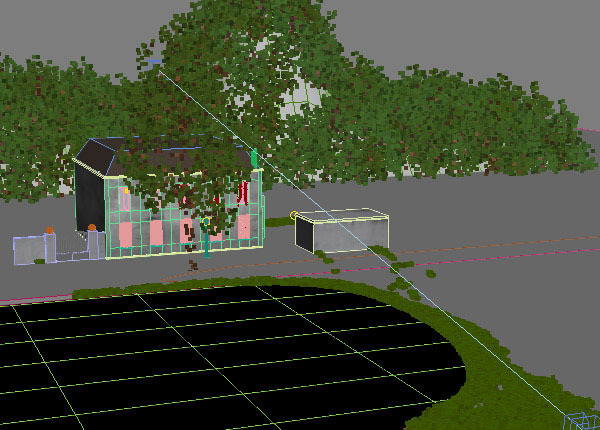 On the contrary, this happens in the render and we must avoid it. 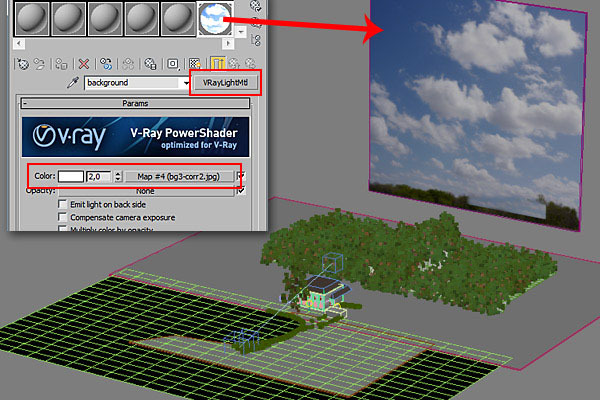 In this current state V-Ray can exclude the reflections of a specific object from another object. In other words,I can not cause the sky to reflect a bit on the leaves but not in the lake, unless you make turns crazy. This is still possible even if support from the Chaos Group I learned that (probably) will be implemented sooner or later. You will be able to write 1,000 books about how to use software, but the only important thing is just to have in our mind the final result, in this case we will reach it into Photoshop. Add a little bit of color correction, increase contrast especially on the reflection of the background in the bottom left (to manually remove the background of the reflection on the lake) and the job is complete. IS EASY , BUT REALLY IT IS? If you thought it was simply is because … IT IS SIMPLE . It is simple if you have clear points of reference and do not proceed by trial and error , it is simple if the reference points are the photograph. I agree because it is clear that you have to practice and practice. And thank goodness! 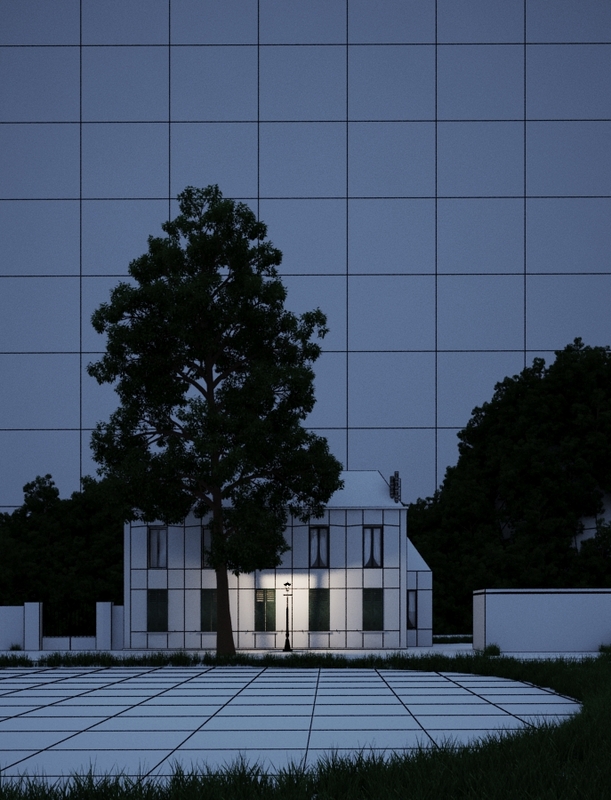 But large part of the problem is the lack of (often) a strong knowledge of art, in this case is photography of sure. Knowing the photography I can use 4 things, so linear and smooth and achieve this by exploiting the mentality photographic. On the contrary, if I know all the manual by heart, without photographic principles I can make just a series of attempts… and good luck! Conversely if you have a strong knowledge of photography and also know a method, this is really easy and possible for everyone! 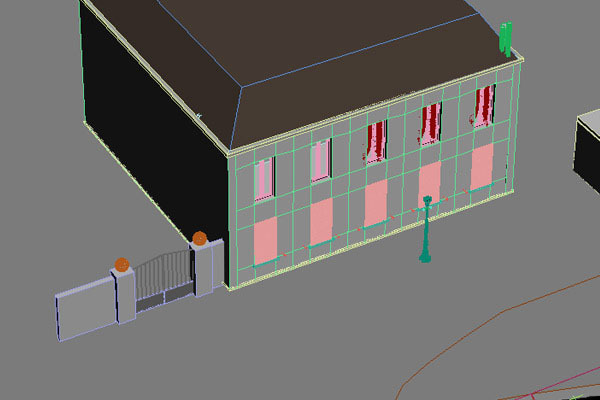 Study photography applied to V-Ray and our method to produce (5SRW) subscribing our online course now! 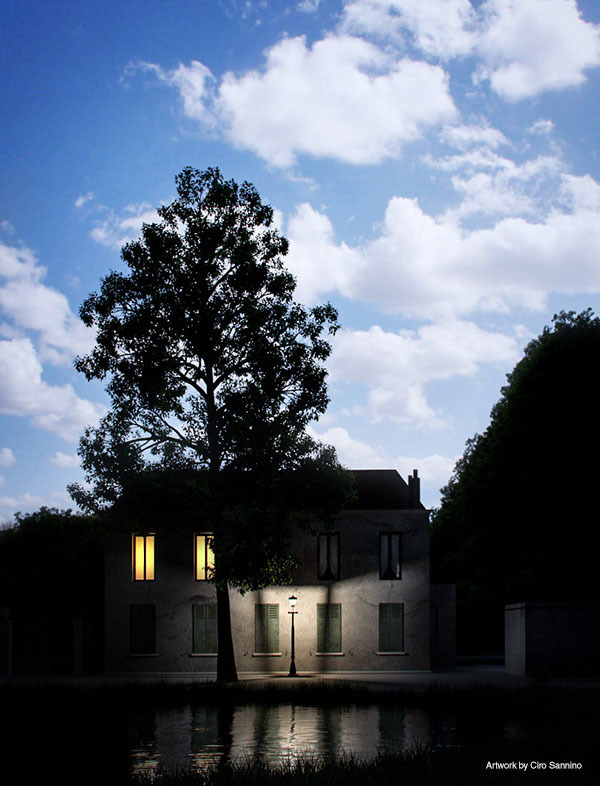 Going back to the last picture, who knows .. perhaps today Magritte would achieve that?